James Rodríguez, pronounced "Hahm-ez," entered the 2014 World Cup as a young player with limited name recognition on the international stage, but that is certainly not the case any longer. While the 2014 World Cup was largely headlined by superstar players living up to that billing, James burst on the scene for Colombia and collectors have noticed the dynamic midfielder. After starting his professional career at the age of 16 with Envigado FC and then moving to Club Atlético Banfield, James Rodríguez made a name for himself at FC Porto. He won the Portuguese Golden Ball (A Bola de Ouro) in 2012 as the best player in the Primeira Liga and was the youngest ever to receive the award. The next season saw his move to AS Monaco for €45 million ($60 million USD), which was the second highest transfer fee for any Colombian player in history at the time. While his club play earned him recognition, James' play in the 2014 World Cup has exposed him to a worldwide audience. James ended his inaugural World Cup with six goals and two assists. Two of his goals came during the 2-0 win in the Round of 16 match versus Uruguay, including a ridiculous volley that was widely considered the best goal of the 2014 World Cup. His spectacular play caused an explosion in value for his cards and even caught the attention of NBA superstar, LeBron James. Although the team finally lost to the host nation, Brazil, in the quarterfinals, Colombia was undefeated until that 2-1 loss. James was later named the Golden Boot winner as the leading scorer for the tournament. Based on his strong play and considerable recognition, rumors immediately began to swirl regarding another record transfer for James Rodríguez. Those rumors came to fruition when it was announced that James would join Real Madrid for the 2014-15 La Liga season thanks to a transfer fee reportedly for €90 million ($120 million USD). Playing alongside global stars like Cristiano Ronaldo and Gareth Bale will guarantee immense exposure for James. James Rodríguez is not the only young star showing considerable potential for collectors. He and Neymar appear to be the future for soccer and both are extremely athletic players who are still in their early-20s. While James is still not quite at the superstar level, he is on a similar path to greatness as Neymar. Currently, James Rodríguez does not have a large amount of cards available, but those that are out there have seen a considerable bump in interest. Click on the card title or image to shop for cards on eBay. 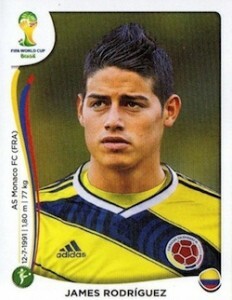 The first known card for James comes from 2010-11 Panini Futebol. The sticker release was available in Portugal and chronicles the first season for James with Porto. The rookie stickers are not currently available in large quantities, but they should pop more often as James becomes a household name. World Club Champion Football (WCCF) doubles as both a card game and Sega video game. The 2011-12 Japanese release is the first true card for James and notes his main skill as "The Artistic Left Foot." Another early card for James, this Mega Craques release might eventually emerge as the go-to "rookie card" for the young Colombian. Simplicity at its finest, 2014 Panini World Cup Stickers are inexpensive and readily available. While this means that the value will always remain low, it also makes this James card the easiest to locate for collectors and special as it is documents his breakout World Cup performance. 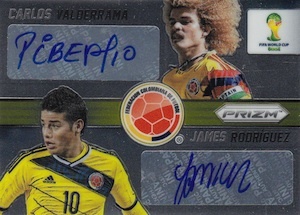 Easily his most popular card, James Rodríguez's 2014 Panini Prizm Signatures card has seen a ridiculous increase in value since the beginning of the World Cup. Savy or lucky collectors could find the card in the $30 - $60 range before the World Cup and even during the first month of the elite tournament. However, after Columbia's win against Uruguay, values skyrocketed. Current prices are already around $300, and pushing higher. This is even more impressive when you consider that his limited Prizm parallel (#/25) was selling for just $100-150 before the World Cup began. While prices will likely come back down after the World Cup ends, James has put himself on the collecting radar, and this will remain one of his most popular cards in the future. 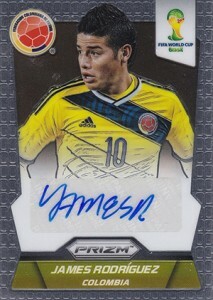 Although he was omitted from both the base and insert sets, James was included in both autograph sets in Prizm World Cup. This incredibly rare card pairs him with former Colombian great, Carlos Valderrama. Only ten cards exist for the base version and another ten are available as a Prizm parallel. Just pulled a James Rodrigues 2015-16 topps champions league auto #2 of 5–Are these pretty rare? Do you have any other information on this particular card? Rodríguez’s earliest card/sticker is actually an Argentinian Panini from 2008 when he played for Banfield.